©2014 All Rights Reserved. Do not reproduce without citation. They were unsure why they all were being taken out that day. To be stood again at a place where no one seemed to care. Her heart could not beat in its syncopated rhythm due to the shock! She had prayed that this day would never come for her children or for her again. She fell onto her knees and cried out to the sky because on earth she had no friend. And it began to rain buckets from the sky. I believe the ancestors were crying was the reason why. By these men whose hearts were cold. Because this was a part of their lifestyle and continued enslavement tricks. On the same date of the sale in 2014, the rain fell too. To never forget the Weeping Time and all that our ancestors went through. If you were the mother on that day, what would you do? Tears continue to fall in my spirit as I think about the Gullah/Geechee women that were sold away from their children and their children, husbands, fathers, and brothers that were sold away from them during The Weeping Time which was the largest auction of one group of African people to ever take place. 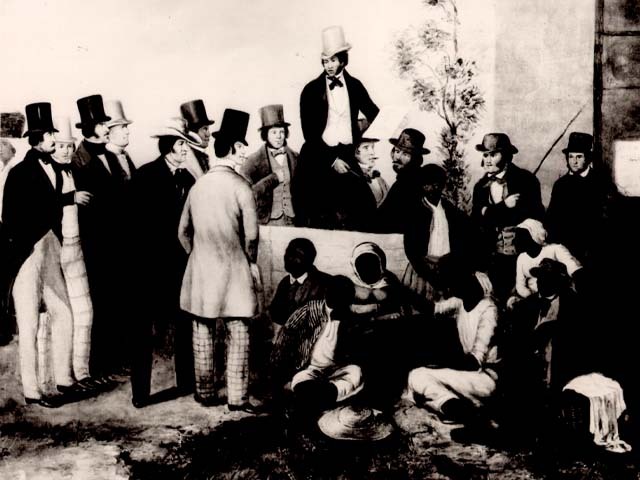 436 Gullah/Geechee women, men, and children were sold in Savannah, GA at a race track on March 2 and 3 in 1859. 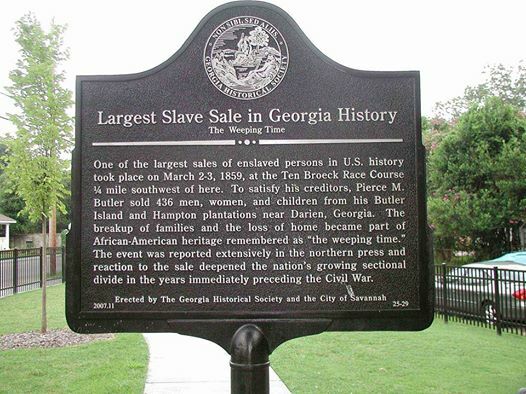 They were sold by Pierce and John Butler who had enslaved them and numerous other African people in Coastal Georgia because he was broke. He then sought to further break the hearts and spirits of these people by selling them for his personal financial gain. De Gullah/Geechee ooman wha bin lib tru disya an keep e mind bin bless ya! E bin able fa gwine on tru de pain fa rebuild wha e could pun de coast. Fa dem wi caan fagit. Fa dem wi caan gib up! 1 George* 27 1832 Prime Cotton Planter $620 Found on the 1870 census for Darien, GA. Last name Broughton. 5 Elisha* 39 1820 Prime rice planter and driver $695 Found in Freedman’s Bank Records (1865-1874) Last name Myers. 11 McPherson 10 1849 Fine boy $730 Found in Freedman’s Bank Records (1865-1874) under name Mack Turner. 15 Robert (Carp’tr) 26 1833 Good plantation carpenter $1,005 Found in Freedman’s Bank Records (1865-1874) Last name Chiffen. Robert is the son of Joe (#9) and first wife Sack (Psyche). 30 James aged ? Gardener $685 Is this the brother of Kate? 39 Delia 13 1846 Prime girl $685 Delia Ramsey? 43 Bram (driver) 47 1812 Prime cot. Dri’r, high character $1,410 Son of Roswell King Sr.
45 Morris 15 1844 Cotton hand–prime boy $1,410 Is this Morris Butler on the 1880 census for Darien, McIntosh, Georgia? 51 Bram 17 1842 Cotton–prime young man $1,385 Son of Driver Bram and Joan. 57 Pompey 11 1848 Prime boy $880 Descendants of Butler slaves? 61 Clary 34 1825 Rice hand–prime woman $655 Is this the daughter of Sophy (born 1790)? 72 Primus (carp’r)* 32 1827 Plantation carpenter $635 Found in the Freedman’s Bank Records, 1865-1874, and the 1870 census for St. Peter’s Parish, Beaufort, South Carolina; Last name Wilson. 75 Infant 1859 Born February 14, 1859 $635 Dead by 1869. 77 Pender 19 1840 Rice–prime woman $840 Pender Gordon? 80 Levi 23 1836 Cotton–prime man $805 Possible match: Found 1870 Census for Ward 4, Natchitoches Parish, LA. Last Name Russell. 82 Kate aged ? $805 Is this Kate Butler? 85 Amorita 17 1842 Cotton hand $950 Is this a descendant of Blake slave Amaritto? 92 Phoebe 15 1844 Cotton, prime young woman $1,205 Did Phoebe marry Morris, the son of Bram and Joan? 95 Ruth 24 1835 Rice, prime woman $800 Is this Betsy’s (the wife of Kate’s John) sister? Jerry and Violet had a daughter named Ruth on November 4, 1834. 103 Wooster 45 1814 Rice hand, and fair mason $300 (Name is probably Worcester.) Found on the 1870 census for Chatham County, GA. Last name Gordon. 105 Com’dore Bob aged ? Rice hand $600 Returned to the Butler plantations after Emancipation; Last name became Bob. 106 Kate aged ? Cotton $600 Is this John Butler’s mother? 107 Linda 19 1840 Cotton, prime young woman $600 Is this the same person as Melinda Roberts who lives with the Bobs on the 1870 census? 110 Mary* 25 1834 Rice, prime woman $1,135 Is this Kate’s John’s sister? 111 Anson* 49 1810 Rice–ruptured, one eye $250 Are they the same as Ansel and Violet Small found on the 1870 census for Beaufort, South Carolina? 112 Violet* 55 1804 Rice hand $250 very sick, probably consumption. Is this the mother of Betsey, #100? 119 Kitty 30 1829 Rice–prime woman $585 Is this Kate’s John’s sister? 123 Andrew 45 1814 Lame in right hand–mill tender $650 Found on the 1870 census for Darien, GA. Last name Stewart. 125 Sena 12 1847 Rice hand, prime girl $650 Did Sena marry Pierce B. Alexander (the son of Aleck and Daphney Alexander)? 127 Ned 56 1803 Cotton hand $485 Ned and Scena Bleach are buried in Butler’s Cemetery, Butler Island Georgia. Ned and Scena are the parents of Flanders, Hannah, Mary, Bess, Thomas, and Ezekiel. 128 Sena 50 1809 Cotton–cook $485 Ned Bleach 11/16/1803-8/9/1886. Scena (Cascena Baker?) Bleach 4/20/1806-8/11/1879. 129 Mary 24 1835 Cotton, prime woman Is this Mary Baker, daughter of Ned Bleach and Caseny (Sena) Baker? 132 Bess 31 1828 Cotton, prime woman $525 Is the Bess Baker, daughter of Ned Bleach and Caseny (Sena) Baker? 144 Somerset aged ? Ruptured $480 Is this Somerset and Phoebe Gordon? 167 Betty 30 1829 Cotton hand $545 Is this the daughter of Sukey and Rentee (shoemaker)? 172 Peter 29 1830 Rice–ruptured $470 Is this the son of Sukey and Rentee (shoemaker)? 181 Amy 38 1821 Rice hand $865 Is this Leah’s daughter? 183 Hagar 40 1819 Rice hand, varicose $695 Descendant of Butler or Guerard slaves? 193 Toney 24 1835 Rice, prime man $700 Is this Toney and Rose’s eldest son? 214 Hopkin’s Frank 54 1805 Rice hand $1,270 descendant of Brewton slaves? 226 Matilda 38 1821 Rice hand, blemished hand $675 Wiseman Ferguson had a daughter named Matilda. 227 Wiseman 19 1840 Cotton, prime young man $675 Found 1880 census for Darien, GA. Wiseman Fuggerson (Ferguson). 240 Cuffy 2 1857 $650 Is this the “Kofi” that the play “Forever Free” is about? 241 Sandy 18 1841 Prime young hand $1,340 This is probably the son of Sandy and Ursula, #242 and #243. 242 Sandy 41 1818 Rice–ruptured $325 Son of Blake slaves Sandy and Lucy? 248 Reuben 48 1811 Cotton–ruptured Is this Quamina’s (#311) brother? 257 Sophy 20 1839 Cotton, prime woman $1,236 Named after her grandmother. 258 Malsey 17 1842 Cotton, prime young woman $1,236 Is this Noble’s wife? Ned and Sena had a daughter named Malsey. 275 Sancho 3 1856 Found: Sancho Bennett, Darien, McIntosh County, GA 1880 Census (laborer in rice fields). 308 Paul 2 1857 Is this Paul Singleton? Drums and Shadows, Tin City. 311 Quamina aged ? Rice Is this Reuben’s (#248) brother? 313 Caleb 15 1844 Cotton, prime boy Is this Caleb Freeney of Florida? 317 Reuben 1 1858 $670 Is this Reuben Freeney of Florida? 319 Jeffrey * 23 1836 Cotton, prime hand $1,310 Boyfriend of Dorcas(#278). Tried to get married before the auction but to no avail. He was sold to the Dismal Swamp of North Carolina. 320 Mingo 54 1805 Cotton hand Is Mingo’s real name Daniel or Samuel? 325 Bill (shoemaker) 58 1801 Rough shoemaker Father of Sallie, line 400. 328 Lucy 23 1836 Cotton, prime woman Flanders (Philander) is the son of Ned and Sena Bleach. 329 Katy 3 1856 Katie Bleach is Katie Hix by 1880. Has a daughter named Philanda Hix. Kate Hicks and family can be found on the 1900 census living with her brother Isaac Green in Darien, GA. Katie’s daughter Rhena (Rena) married Lee Hutcherson. 330 Patty 3 mos 1859 Patty is not listed on the 1870 Census. 333 Martin 44 1815 Rice hand Martin and Charity Butler found on 1870 Census in District 7, Chatham County, Georgia. 349 Lowden 54 1805 Cotton $300 Found London (should be Lowden) and Hagar Bennett 1870 Census for Brunswick, Glynn County, GA. Lowden and Hagar are the parents of Rina (#116) Source: SavannahConnect news article dated March 2008, regarding historical marker for Butler slave auction. 350 Hagar 50 1809 Cotton $300 Was Hagar a muslim? 353 Lettia 11 1848 Cotton $300 Name is Letitia according to the SavannahConnect new article dated March 2008, regarding historical marker for Butler slave auction. 354 Fielding 21 1838 Cotton $1,295 Is this Fielding Bennett on 1880 Census for Darien, Georgia? 355 Abel 19 1840 Cotton $1,295 Was Abel a Muslim? 356 Smith’s Bill aged ? Sore legs Withdrawn. Found on the 1880 Census for Darien, McIntosh, Georgia. Last name Williams. 401 London’s Kit 26 1833 Rice Is this the child of cooper London? 406 Silas 26 1833 ? 407 Phoebe 19 1840 ? Is this the daughter of Betty and Driver Frank? 409 Lamotte 23 1836 ? 410 Martha 22 1837 ? 411 Peter 24 1835 Cotton Is this the son of Sukey and Rentee? 413 Dicey 20 1839 Cotton Is this the daughter of Sukey and Rentee (shoemaker)? 420 Jeffrey 18 1841 ? 422 Hannah 23 1836 Cotton, prime woman Is this Hannah Baker, daughter of Ned Bleach and Caseny (Sena) Baker? 423 Thomas 21 1838 Cotton hand Is this Thomas Baker, son of Ned Bleach and Caseny (Sena) Baker? 424 Ezekiel 17 1842 Cotton, prime young man Is this Ezekiel Baker, son of Ned Bleach and Caseny (Sena) Baker? May the world never forget The Weeping Time and the Gullah/Geechee families that were destroyed on that day. May de Gullah/Geechee ooman’s tears stop flowing as e pray.